Launched in June 2008, UP’s online community of volunteer researchers over the past nine years has worked with medical examiners, coroners, and forensic investigators from 55 counties to solve 471 cases. Our members’ genealogical investigative skills, selflessness, and determination are the reason for UP’s success. Their dedication means 471 families no longer wonder what happened to a parent, child, sibling, aunt, uncle, or another relative – and many of these formerly unclaimed individuals have found their way home for proper burial. Please join us in celebrating Unclaimed Persons’ anniversary and success by following us at www.facebook.com/unclaimedpersons. 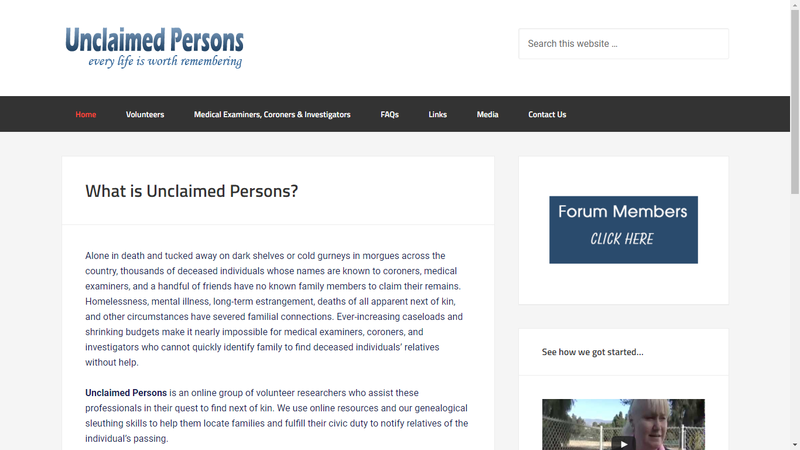 We also hope you will consider becoming a member to help fight the quiet unclaimed epidemic in morgues across the U.S. More information is available at our NEW website, www.unclaimed-persons.org . Megan Smolenyak Smolenyak started this project nine years ago and then a number of researchers volunteered and took it over. I worked a bit on some cases - it was fun to be helpful and instructive to research formerly 21st century living persons. The group works in a collaborative fashion. If this interests you, please volunteer. Note, however, that you cannot share information about the cases outside of the closed Facebook group.